Popeye the Sailorman has for decades been an American icon and a big part of the United States’ military’s history. Now, Popeye fans can add officially licensed Popeye Tin Can sailor designs from Vision-Strike-Wear.com to their collection of great Popeye gifts and memorabilia! 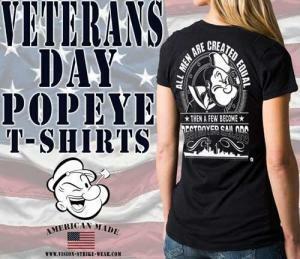 All Popeye shirts and hoodies are Made in America! Fans may purchase branded merchandise of all the different branches of the Armed Forces. 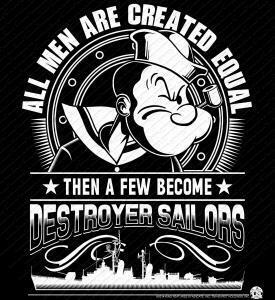 Below is a U.S. Navy design featuring Popeye that is available on printed T-shirts and hoodies. Popeye fans can purchase this T-shirt here. 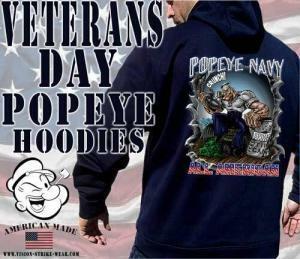 Popeye fans can purchase this hoodie here.